So I have a little rant here, and I wonder if you can guess what it is? Well if you look to the picture on the right here and say to yourself, "My, what a delectable looking pizza" then you really won't appreciate what I'm going to say next. Fruit and meat. Meat and fruit. Sweet and savory. Repeat after me people, they do NOT belong together. I feel almost as strongly about this as I do about the fact that KFC and Taco Bell should not be available in a single restaurant form. Now normally I save my blog for more amiable musings however the horridness of mixing fresh fruit and cooked meat in the same dish makes me want to gag. Get that pineapple out of my pizza, get those walnuts and strawberries out of my salad, your apples and raisins out of my stuffing, and for gosh sakes get your stinkin mangos out of my salsa! All I can say is WHAT UP PEOPLE? If you are going to go to all the trouble to heat up fruit then it must be paired with sugar and... let's say a crumble crisp topping for starters. Fruit is naturally sweet and therefore predestined to be enjoyed in dessert or treat form. Mixing it with cooked flesh could be considered in bad taste at best or an abomination at worst. Meat on the other hand is savory. An earthy, scrumptious, canine tearing sustenance. It screams for spices, rubs, sauces, and especially gravy. Why go and muck it up with some poor hapless fruit that would be much better served in a cobbler or pie? If you are one of those people (and you know who you are) who actually enjoy the aforementioned combination and have no compass of what it tastes like to me, I shall give you an example to best describe it's assault on my taste buds. Remember the episode of Friends where Rachel tries to cook a trifle? The pages of the cook book have stuck together and she accidentally makes half trifle, half shepherds pie? I think the exact layers are, lady fingers, peas, strawberry jam, ground beef. When Joey takes a big bite he declares it "TASTES like FEET". Now you know what fruit and meat do to my pallet. Thank you. 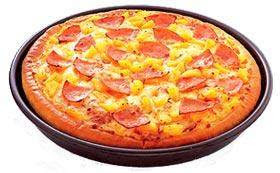 I myself LOVE LOVE LOVE hawaiian pizza!! Go anywhere where there is a choice of pizzas sitting out and the Hawaiian slices disappear first! Ham (or Canadian Bacon) and Pineapple will always be a winning combo. But I do love my wife, so when I order a pizza, I test the pizza maker's math abilities by asking them to only put pineapple on 2/3 of the pizza.